So Halloween just ended (you may have noticed from the sudden flood of Christmas products today), and it really made me miss the old days when I used to go trick or treating. If you know my backstory, you’ll know that I was in Hong Kong for five of my teenage years, which meant I missed out on five years of free candy since trick or treating was not recognized in HK. If you knocked on someone’s door on October 31st there, pestering them for candy, you may get rewarded with your very own restraining order. It’s not just the candy that I miss. I have always loved dressing up as someone/something else. I remember one of my first costumes was Sailor Moon. After that, I kept finding excuses to wear costumes. I discovered cosplaying, which was an outlet, but what’s so special about Halloween is that everyone can be in costume! Every year, I get my mom to make me a costume (she loves designing them), but sadly, I don’t have much reason to wear them. Unless I choose to go to a party. 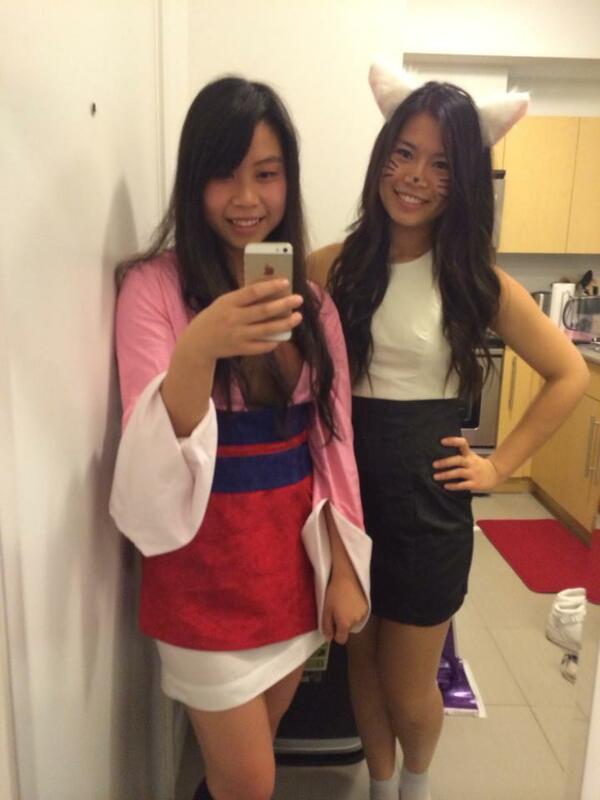 A quick picture I snapped with my friend before the party. I was Mulan for the night! Parties aren’t always my thing, but it’s one of the few ways someone my age can wear a costume. Last year, I chose not to go, so I missed out on dressing up. I chose to party this year, and while I didn’t really enjoy the partying bit, I was in costume. I guess you win some, and you lose some. But what I’ve noticed is that at parties and on campus, very few people actually care about their costumes. Put on a pair of bunny or cat ears, and voila, costume completed. On Halloween day, I didn’t have the guts to wear a costume to school. I did in my first year, but it was quite embarrassing since no one else dressed up. But I saw a few people walking around with costumes this year, and it made me super happy. Huge props to them for being brave and throwing on a costume! It really takes more guts than you would think. I sincerely hope that they had a wonderful time being someone else for a day, and I could only wish that I had their courage. My blog gets a lot less traffic than UBC Compliments’ Facebook page, so I also posted something similar to what I said above there. Hopefully, my message reaches the people who dressed up! You wanted a seat? Have knee pains instead. Somewhere along the way, halloween became an adult holiday. I think it happened in your generation haha. Where did you end up going? You can dress up for Halloween at any age and anywhere! I didn’t even start until 27 and it was so much fun I did it for the next few years. I still would but I don’t have the motivation to do it these days. You are so right about not having to be yourself when in costume. It’s a good feeling. Crap, I must not like being in my own skin. Did anyone know you were suppose to be Mulan? Or did you have to belt out “Reflections” by Christine Aguilara all night? I don’t really know what I’m talking about..hahaha. I’m not going to lie. Every time I tried on the costume before the actual night, I would start randomly singing Reflections into the mirror as I made sure it fit. But I doubt everyone knew who I was XD The costume was pretty different from the actual thing…I got someone thinking I just wore a Kimono. All very funny and true observations! We don’t have such a big Hallowe’en thing there – and I noticed even as a child reading Judy Blume that USA Hallowe’en seemed to mean any costume, while here it’s just scary stuff. Good for you for going along to the party in costume! Ugh, glad you guys actually respect that Halloween should be at least a bit frightening, and dress accordingly so. Hey. I’m only 4’10” – I can get by with it! my husband said if I’d get in costume, he’d drive me around, LOL. Very tempting but I didn’t. somehow, it didn’t seem fair. But I was truly too tempted. That is a thought. I could go as a grown up! Now that would truly be a costume. Hehe genius 😛 Now that’s a scary costume!